Every do-it-yourselfer knows just how important a good ladder is for both interior and exterior jobs. Even simple maintenance like changing a light bulb is much easier when you have a stepladder on hand. But it's also important to follow stepladder and extension ladder safety to keep those DIY projects from turning into a trip to the emergency room. It all starts with a project idea. You need a ladder to paint your two-story foyer or you're ready to scale a ladder to clean out your gutters. Whatever the project, you need to carry your ladder to the site safely. Always move your ladder in the most compact position possible. For a stepladder, that means folding it up before moving. For an extension ladder, you should make sure it's as short as possible with all telescoping sections down, rather than extended. If you're moving an extension ladder, find someone to help to make the job easier. When you carry any ladder, you should position it so the widest part goes down toward the ground. Always watch for overhead power lines, tripping hazards and other obstructions while you're carrying the ladder. Once you're in your work spot, you need to set the ladder up safely. Always choose a flat area that's dry and firm. You don't want to set up a ladder on ice, mud, snow or other potentially slippery surfaces. Keep it clear of overhead power lines or wires that connect to your home. An extension ladder needs to lean against a solid surface, never a window. It's also best to avoid setting up in front of a door because someone can come out of the door and hit the ladder. Never put your ladder on a box or other structure to give it more height. It's much safer to choose a ladder that's high enough for the job. The best ladder for a homeowner project is one that extends at least 3 feet beyond the height you need to stand or at least 3 feet above the edge of your roof if you're climbing onto the roof. When using a stepladder, open it completely. Never climb a stepladder in the closed position. You'll need a large enough area that's flat to fully open and support the ladder. 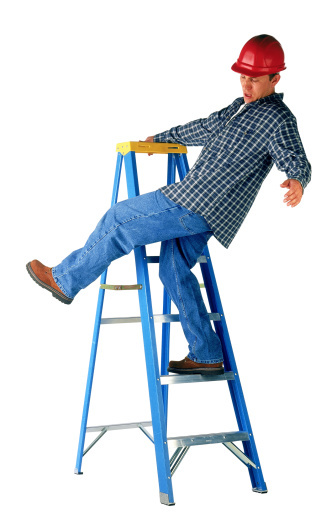 Test the stepladder before climbing to make sure it's stable and won't tip. For an extension ladder, you first need to raise it and then position the feet far enough away from the building for a safe angle. Start with the bottom pushed up against your house. Lift the top from the ground, walking your hands from rung to rung as you raise the ladder. You can press the ladder against the house to create pressure that helps you raise it. Move the base away from the house enough to keep it stable. Then, use the rope pulley system if your ladder has one to extend it to the height you need. Now, you can reposition the base. The guideline is to move the base 1 foot away from the house for every 4 feet of height on the ladder. If you're using a 24-foot ladder, the base should be about 6 feet from the house. Proper positioning keeps your ladder steady, but extra support makes it even more secure to prevent tipping or wobbling. A ladder stabilizer attaches to an extension ladder to give it more stability. It's a wide tubular structure that rests against the house. Non-skid pads on the ends help keep it from slipping. Stabilizers are often used to work around windows, but they can give your extension ladder extra stability no matter how you use it. If you're working with a partner, have him hold the base of the ladder while you're on it. This can help give the ladder more stability as you climb. Ready to climb your ladder? The best way to hold a ladder when your going up or down is to maintain three points of contact. That means when you're raising your foot to step up to the next rung, your other foot and both hands need to stay in contact with the ladder. When you move your hand to the next rung, both feet and your other hand should touch the ladder. Move slowly, keeping your body toward the center of the rung to avoid shifting weight to one side. Ladders are very useful for home improvement projects, but they can also be dangerous when not used correctly. Follow ladder safety guidelines to avoid injury to yourself or damage to your home.